During World War II, thousands of British, Dutch, and Australian POWs died from similar marches and treatment at the hands of the Japanese. However, the world was unaware of the atrocities for years. 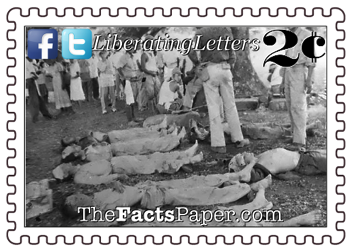 Fearful Japanese forces would respond with even harsher brutality towards prisoners, the American government decided not to publicize the Bataan Death March. However, Democrat President Franklin D. Roosevelt reconsidered as a war-bond drive commenced. Escaped survivors who managed to make their way to Australia started telling their story. Roosevelt reenergized the war-weary Americans to continue their fight by releasing the soldiers’ stories on January 27, 1944, as well as propaganda posters regarding the treatment by the Japanese. Soon after, Life magazine featured the soldiers’ stories. While Lt. Gen. Masaharu was unaware of the barbarism Tsuji perpetrated among the prisoners, a U.S. military commission in Manila placed him on trial for the inhumanity. Found guilty, a firing squad executed Masaharu on April 3, 1946. Tsuji escaped to China following the war while other Japanese generals were found guilty of gross mistreatment of prisoners and hanged on December 23, 1948. Veterans of the campaign formed the American Defenders of Bataan and Corregidor (ADBC), pressing Japan for reparations as well as improved recognition by the American government. As a result of their efforts, in 1983, Congress passed a law awarding the Bronze Star to those stationed in the Philippines and Corregidor during this time. As units from the Coastal Artillery of the National Guard from New Mexico comprised a large number of Bataan soldiers, the Bataan Death March has made a lasting impression on the citizens of the state. Descendants of those soldiers, as well as other supporters of the military, gather each spring to participate in the 26.2 mile Bataan Memorial Death March in White Sands Missile Range, New Mexico. In addition to the march, non-perishable food and other charitable items are collected. 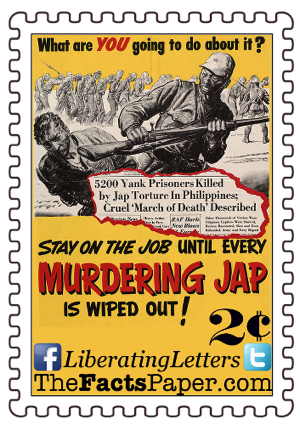 Liberty, the Japanese assumed the Americans would be impotent militarily after Pearl Harbor. Nine days after the surrender at Bataan, and just four months following Japan’s attack on Hawaii, Lieutenant Colonel James Doolittle let a heroic and completely surprising air raid on Japan. (see Doolittle Raiders Do Much) Japan did not anticipate America’s determination, but was soon recognized by Japanese Admiral Isoroku Yamamoto. Following Pearl Harbor, he commented, "I fear all we have done is to awaken a sleeping giant and fill him with a terrible resolve." Despite the progressive education propaganda, Democrat President Harry S. Truman was not rubbing his hands together like a sinister dictator, laughing evilly as he ordered the bombings. As stated, the Japanese did not believe in surrender. They were going to fight until their enemy, or they, were completely destroyed. While preparing an attack on Japan that would result in 10 times the casualties of Normandy, Truman painfully made the decision to use the bombs instead, knowing the Japanese would never compromise or give up. They had to be defeated. Liberty, many today want to focus solely on America’s mistakes while both ignoring our successes as well as the failures of others. The Bible tells us that from the Fall of Adam and Eve, humans have done despicable things to each other. (see Fruit Of The Forbidden Tree) Many want to conveniently place the problem at the feet of a nation or ideology, claiming it’s an American problem, a Russian problem, a Japanese problem, a Jewish problem, a Christian problem, or a Muslim problem. However, by doing that we subscribe to the exact same reasoning every nation and ideology has used to conquer and suppress others. The truth is we have a human problem, Liberty, and it is exacerbated by the increasing rejection of God. Many profess if they just eliminate this group or that ideology, then they can bring forth Utopia. (see One World Disorder and Suffering In Utopia) Yet it never works as those that gain leadership roles and then power always become drunk with it, resulting in greed, suppression, and death. The Japanese government finally reached out to several survivors and their families in 2010. Covering their expenses for a trip to Japan, Foreign Minister Katsuya Okada apologized on behalf of his country to the Americans. Forgiveness is the key and the truth shall set you free! Without it, we are marching to our own deaths, yet ours will be eternal. If Jesus can pray, “Father forgive them for they know not what they do,” while hanging on the cross, then we should be able to forgive others and ourselves for the past. Then work even harder to do better now and in the future. Smoke filled the air in Pearl Harbor as fires burned. Medics tended to wounded as survivors collected the dead, both military and civilian. While Americans in the mainland heard of the atrocity committed against their fellow citizens in Hawaii, Japan was just beginning their true mission. When Japan attacked Pearl Harbor on that fateful morning of December 7, 1941, their purpose was not to engage the United States in war. Their goal consisted of eradicating the United States Navy, leaving them free to pursue their true objective, conquering southeast Asia and the southern Pacific. Within 24 hours of their surprise attack on Hawaii, Japan completed similar missions on Malaya, Guam, Hong Kong, Wake Island, Midway Island, and the Philippine Islands. (see A Date That Will Live In Infamy) With the United States Navy incapacitated, Japan conducted their raids free of fear of an American response. At the time, roughly 22,000 American troops were already stationed in the Philippines to help the Filipinos prevent Japanese naval forces from entering Manila Bay. In July of 1941, General Douglas MacArthur reentered active duty, taking command of the U.S. forces in the Pacific. Prior to his arrival, the defense strategy, known as the WPO-3, laid out plans to defend the area to the end. If the Japanese penetrated the Philippine Islands, they were to withdraw to the Bataan Peninsula. Though a tactically sound defense plan, MacArthur abandoned it, replacing it with one he considered more aggressive. Without support from the United States Navy, 43,000 Japanese troops secured the Lingayen beaches on December 22. Understanding the severity of the situation, and the new obstacle of no naval support, MacArthur reactivated the WPO-3 plan. American and Filipino forces were ordered to evacuate to the Bataan Peninsula. The Battle of Bataan ensued, beginning on January 7, 1942, and continuing until April 9, three days after the United States declared war on Germany. (see The Day America's Neutrality Sank) Low on supplies and unable to obtain any more due to Japanese blockades and raids destroying supplies, ammunition, and fuel, the men were close to starving and defenseless. In addition, many suffered from tropical diseases, such as malaria and dengue fever. Unable to defend the peninnsula, Major General Edward King Jr. surrendered the 75,000 combined troops to Colonel Mootoo Nakayama of the Japanese Army, ending the first major land battle in World War II for the United States. It was also one of America’s most crushing military defeats ever. Immediately, Japan’s Lieutenant General Masaharu Homma ordered the prisoners moved north as he prepared for his final attack on Corregidor. However, twice as many Filipinos and Americans surrendered than Homma expected. The Japanese, led by Colonel Masanobu Tsuji, arranged for the prisoners to march the approximately 60 miles from Mariveles to a train station in San Fernando. Before the march even began, under Tsuji’s command, the Imperial Japanese Amy promptly executed nearly 400 men in the Philippine Commonwealth Army, known as the Pantingan River massacre. Unarmed soldiers, many weak from starvation, dehydration, and disease, were lined up on the riverside, then crassly shot, bayoneted, or beheaded. Broken up into groups of 100, the surviving prisoners emptied their pockets of all personal property. While confiscating valuables such as jewelry and other mementos, the captors slapped and abused their prisoners. Upon discovering Japanese money and souvenirs among an officer and two enlisted men, the three were escorted behind a rice shack. Believing the items were stolen from dead Japanese soldiers, ironically similar to what they were doing to the Americans, the three soldiers were shot. Word spread rapidly, resulting in soldiers quickly and secretly discarding or destroying their Japanese keepsakes they actually obtained from trading with the Filipinos for items such as cigarettes. The Japanese strongly adhered to the Samurai code of bushido. This principle promotes honor to those who fight to the death while those who surrender are held in contempt. The American and Filipino soldiers were viewed as slaves, or property, to be used for forced labor. Therefore, as the Japanese Army marched their captives north, no respect or mercy was shown. The Japanese deprived the prisoners already suffering from malnutrition much needed food and water. As the blistering sun beat down, prisoners were forced to sit in direct sunlight without any head cover, known as “sun treatment.” When the men came upon fresh water, they were forced to sit in sight of it, but denied partaking of it. If someone dare ask for water, or attempt to collect some, he was shot on sight. Under the circumstances, it may have been preferable. Most groups took at least five days to complete the march. As they prepared to continue in the morning, prisoners unable to march on were buried alive. Those who collapsed during the march were often run over by trucks. “Cleanup Crews” followed behind each group, killing soldiers too weak to proceed. Occasionally, a moment of compassion found a fatigued prisoner as they were allowed to ride in a truck instead of being disposed of. Just because they could, Japanese soldiers randomly beat and stabbed their American and Filipino counterparts with bayonets. The prisoners were even denied bathroom breaks, forcing them to defecate and urinate on themselves. Filipino citizens watched as their native brothers marched passed them. Some experienced compassion for the mistreated prisoners, tossing them bits of food. For their mercy, Japanese soldiers rewarded them with a bullet. Those surviving the march to San Fernando were shoved into World War I style boxcars to be taken further north. The cars were so packed, the weak and ill prisoners were forced to stand, where again bathroom facilities were denied. Inside the closed and compacted areas, the heat took even more lives. Men died as they stood, remaining in that position until they reached Capas and were unloaded. The survivors walked the additional eight miles from Capas to Camp O’Donnell, where the Filipinos and Americas were separated into two different facilities. Conditions proved to be as merciless and barbaric at Camp O’Donnell as they were on the march, resulting in thousands of more deaths. 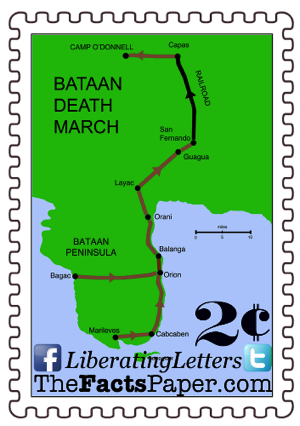 Dubbed the Bataan Death March by its survivors, estimates of 7,000 to 10,000 deaths occurred along the route. An actually number is impossible to determine as it is believed some were able to escape into the jungle, with others being captured at a later time. Upwards of 500 Americans and 2,500 Filipinos are considered to have died during the march. Starvation and disease took another 1,500 Americans and 26,000 Filipinos in the camp, with 100 prisoners dying every day. To put it in perspective, Prisoners of War (POWs) held by Nazis and other Axis powers in the European campaign experienced a death rate of roughly 3 percent. The death rate for those in the Bataan Peninsula is calculated at more than 30 percent.